What Do You Know about Epson Surecolor S-series? Epson Surecolor S-series, the most advanced roll-to-roll solvent printers to date –the 64-inch production S40600, S60600 and S80600, redefine the price-performance equation, delivering Unparalleled Productivity and Best-in-Class Image Quality. Epson SureColor S40600, 64-inch solvent printer with 4-color CMYK ink set. This entry-level solvent printer replaces the SureColor S30670 with a faster-dying UltraChrome GS3 Ink that has improved outdoor durability. The Dual-Array PrecisionCore TFP Print Head was designed for high speeds with greater resistance to head strikes and banding as well as all an new dot precision for crisper prints. Plus, the new Precision Media Feeding System allows the media to be consistently fed for unattended roll-to-roll printing. Prints up to 215 square-feet per hour (banners). The S40600 began shipping this month. Epson SureColor S60600, 64-inch solvent printer with dual 4-color CMYK ink set that meets the chemical requirements of the Nordic Ecolabel. This printer, pictured above, which replaces the Epson SureColor S50670, is ideal for busy print shops that need consistent, high-volume output every day. 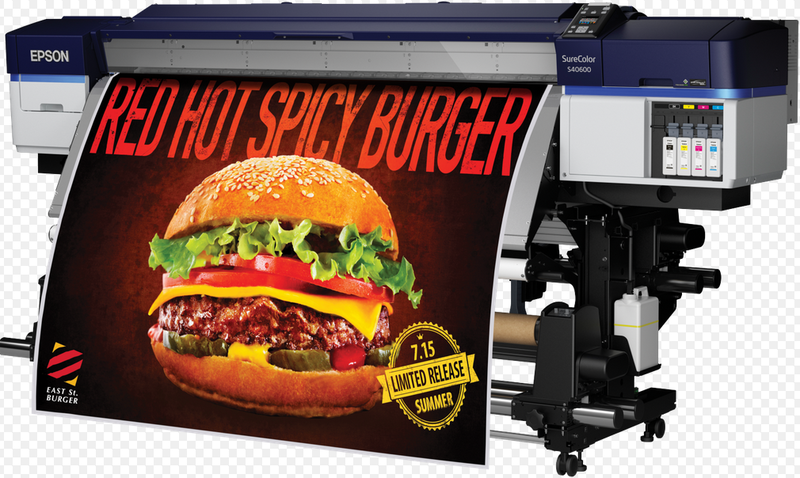 Shops will see good ROI by printing up to 550 square-feet per hour (banners). The S60600 began shipping this month. Epson SureColor S80600, 64-inch solvent printer with 9-color ink set. Get lots of ink versatility with this cutting-edge machine that includes an all-new UltraChrome GS3 red solvent ink for greater color gamut, and the option for white or metallic silver ink that can be mixed with other colors. Prints up to 290 square-feet per hour (banners). All three printers are outfitted with automatic media alignment and automatic print head maintenance, so you don’t miss a beat in production. The S80600 will begin shipping in March.